Bridging the sciences and humanities, an online anthropology degree gives students the chance to learn how humans evolved and to develop critical thinking and communication skills for various careers. While employment for anthropologists will grow slower than other occupations (at a rate of 4% from 2016 to 2026), certain jobs still require anthropologists, according to the BLS. For example, businesses need anthropological research to understand consumer demand, analyze markets, and target specific demographic groups. The BLS also notes that anthropologists perform fieldwork in the United States and foreign countries. Additional career opportunities for graduates include positions in education, health sciences, international development, and museums. What Else Can I Expect From an Online Bachelor’s in Anthropology Program? 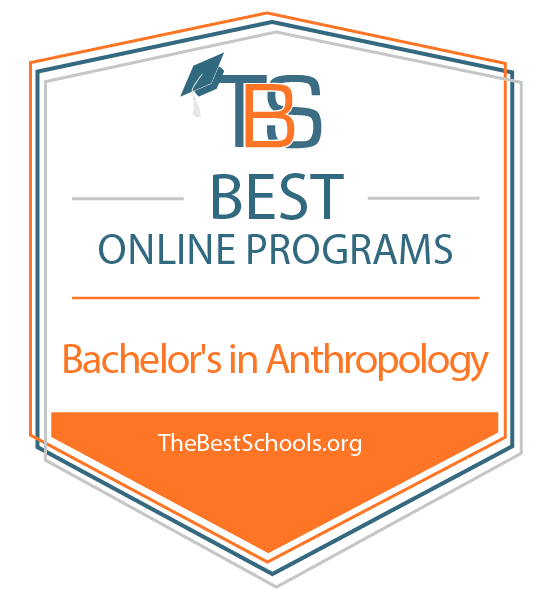 What Are the Best Online Bachelor’s in Anthropology Programs? University of Central Florida ranks #1 on The 10 Best Online Bachelor’s in Anthropology Degree Programs! The University of Central Florida’s bachelor’s in anthropology online degree program teaches students about humans and human interaction while preparing them for careers in archeology, conservation, forensic investigations, public policy, and product development. To graduate with an online anthropology degree from UCF, students must complete at least 120 credits of both general education and major-focused coursework. Core anthropology courses include language and culture, the history of anthropological thought, human origins, and human biological diversity. Students may also take electives focused on Florida archeological history, Caribbean cultures, ancient Native American cultures, rural societies, primatology, and Old World prehistory. Most students graduate within four years if they attend full time. To apply to UCF as a freshman, prospective students must provide their high school transcripts or GED scores and SAT or ACT scores. While the university does not require an admissions essay, it strongly encourages applicants to submit one. The university offers affordable tuition for online students paid by the credit hour, with Florida residents having access to lower in-state rates. UCF delivers the same resources to online students as on-campus learners. This includes career services, financial aid support, an academic resource center, one-on-one advising, a digital library, a university writing center, and even online therapy for those dealing with mental or emotional challenges. The school also provides a full list of services for military veterans. Located in Orlando, UCF is regionally accredited from the Southern Association of Colleges and Schools Commission on Colleges. Oregon State University ranks #2 on The 10 Best Online Bachelor’s in Anthropology Degree Programs! Oregon State University’s bachelor’s in anthropology online degree program provides students with a comprehensive educational experience in anthropology while building communication, critical thinking, and teamwork skills. Graduates go on to work in academia, government, business, healthcare, media, and law. Students in this online anthropology degree program take classes in evolution, global conflicts, poverty and wealth, and natural resource management. Other key subjects include cultural history, world peoples, forensic anthropology, and cultural and biological constructs of race. Within the major, students may select from four distinct concentrations: archeology, bio-culture, culture and linguistics, and general studies. Regardless of their path, all students must complete at least 60 major-focused credits. General education classes, electives, and College of Liberal Arts requirements round out the rest of the 180 credits they need to graduate with a bachelor’s degree. All distance learners pay the same per-credit tuition even if they do not officially live in Oregon. First-year students must have a high school diploma or GED and submit their ACT or SAT scores. They also must provide an “Insight Resume,” which offers context into their accomplishments, perspectives, and talents. Oregon State also has a flexible transfer policy, as students may complete many of their general education requirements at a different school. However, they must complete at least 45 of their last 75 credits at Oregon State to receive a degree from the university. Located in Corvallis, about 50 miles from the Pacific Coast, Oregon State is regionally accredited from the Northwest Commission on Colleges and Universities. Colorado State University - Fort Collins ranks #3 on The 10 Best Online Bachelor’s in Anthropology Degree Programs! Colorado State University-Fort Collins allows students to acquire a BA in anthropology degree online. The robust program gives students a cohesive understanding of people and cultures, past, present, and global. It also provides in-depth training on the use of methods, theory, and data to conduct sound research. Through this 120-credit, four-year program, students take classes on subjects like human origins, archeology of North America, lithic technologies, evolution, human biology, and paleontology. To supplement their studies, students may choose from degree minors in agricultural business, business administration, economics, gerontology, environmental sustainability, media studies, political science, and sociology. Distance learners at Colorado State have access to unique in-person, optional field experiences: studying at a paleontology field school in Wyoming, an archeology field school in northern Colorado, and an ethnographic field school at the Pine Ridge Indian Reservation in South Dakota. This field work lasts several weeks each and allows students to learn directly from leading researchers. Students may start the program in the fall, spring, or summer semesters. Eligible applicants must have a minimum 2.0 GPA across all previously completed college coursework and a high school diploma or GED. All students enrolled in the program, regardless of their state residency status, pay the same tuition rate. Located in Fort Collins, Colorado State is regionally accredited from the Higher Learning Commission. University of Florida - Online ranks #4 on The 10 Best Online Bachelor’s in Anthropology Degree Programs! The University of Florida’s B.A. in anthropology online degree program prepares students for careers in business, government, academia, healthcare, media, and the nonprofit world. To deliver a truly comprehensive learning experience, this program takes a global perspective and combines subjects like archeology, paleontology, anthropology, and linguistics. Of the 120 total credits required to graduate with a bachelor’s degree, 34 must be anthropology classes. Available courses include cultural anthropology, world archaeology, and language and culture. A three-credit capstone course incorporates everything students have learned throughout their studies. UF’s online anthropology degree program is also transfer-friendly, accepting credits from most accredited colleges and universities. Prospective transfer students must submit their high school transcripts or GED scores, transcripts from all previously attended postsecondary institutions, and college-level exam scores. Incoming freshman must provide all these materials and their ACT or SAT scores if they graduated high school within the past five years. All distance learners enrolled through UF Online pay the same per-credit tuition, even if they live outside the state of Florida. They also have access to a flexible schedule, as the school offers both synchronous and asynchronous classes and the ability to attend part or full time. UF Online also allows online students to take a semester off without forcing them to reapply for admission. Located in Gainesville, UF is accredited from the Southern Association of Colleges and Schools Commission on Colleges. Troy University ranks #5 on The 10 Best Online Bachelor’s in Anthropology Degree Programs! Troy University’s four-year online anthropology degree program considers the disciplines of linguistics, cultural anthropology, and archeology. This is also a solid program for those who later plan to pursue an online anthropology master’s degree. Students have access to the Troy Archaeological Research Center, which gives them hands-on experience and part-time employment opportunities. Through the center, students can engage in fieldwork across the southern United States. Many Troy anthropology graduates go on to become archaeologists, museum curators, geographers, teachers, journalists, and policymakers. The entire anthropology degree online program requires students to complete 120 credits, including general education and elective courses. To apply to Troy, incoming freshman can be automatically accepted if they have at least a 2.0 high school GPA, a high school diploma or GED, and a minimum score of 20 on the ACT or 1030 on the new SAT. Prospective transfer students must have maintained at least a 2.0 GPA in all previous college-level coursework and currently be in good academic standing. Troy also has a friendly transfer policy, accepting most credits from accredited colleges and universities. It makes accessing online course materials easy and charges the same rate of tuition for all distance learners, even if they live outside the state of Alabama. Troy is regionally accredited from the Southern Association of Colleges and Schools Commission on Colleges. Florida International University ranks among The 10 Best Online Bachelor’s in Anthropology Degree Programs! Florida International University delivers a unique online bachelor’s degree in sociology and anthropology. The program combines the discipline of sociology — which examines current social problems — with the anthropological study of people, cultures, and societies past and present. Students also learn critical skills related to social surveying, data analysis, statistical sampling, analytics, and computer-based mapping. Available through FIU Online, the anthropology online degree program enables students to access course materials when it is convenient for them, while an intuitive digital learning platform allows for real-time discussions with instructors and peers. All students also have a personal success coach to ensure they remain on the right track as they move through the program. Due to the wide variety of experiences to which students have access, FIU graduates tend to have varying career options. Many move into careers in policy development, politics, journalism, education, social work, healthcare administration, and business. Others seek a online anthropology master’s degree. Of the 120 total credits students need to graduate with a bachelor’s degree, 30 must be in their major. These include subjects like research methods, societies around the world, social theory, social research, environmental studies, and cultural anthropology. To be accepted into this anthropology degree online program, students must have a minimum 2.0 GPA and have taken their last 30 credits at FIU. They also must have taken and passed at least 48 upper-division courses and fulfilled a foreign language requirement. Located in Miami, FIU is regionally accredited from the Southern Association of Colleges and Schools Commission on Colleges. Arizona State University–ASU Online ranks among The 10 Best Online Bachelor’s in Anthropology Degree Programs! Arizona State University offers a BA in anthropology degree online that explores human beings, cultures, and societies throughout history. The 120-credit program involves two seven-and-a-half week terms each semester and 39 total courses. This format enables students to move efficiently through the program and receive their bachelor’s degree in four years or fewer. ASU has one of the most diverse online anthropology degrees in the nation, with coursework covering wide-ranging topics like food and culture, globalization, medical anthropology, and urban and environmental health. Students may also take classes on lost tribes and civilizations, global health, social networks, ancient ruins, and human evolution. For first-year freshmen applicants, admission requirements include a minimum 3.0 high school GPA and an ACT score of at least 22 for Arizona residents (24 for non-residents). Prospective transfer students must be in good academic standing and provide their transcripts from all colleges and universities previously attended. Once enrolled in the anthropology online degree program, both state residents and non-residents pay the same affordable tuition rate. ASU is regionally accredited from the Higher Learning Commission of the North Central Association of Schools and Colleges. Regis University ranks among The 10 Best Online Bachelor’s in Anthropology Degree Programs! Designed for those with a curiosity about the human condition and other cultures and societies throughout history, Regis University’s four-year online anthropology degree program delivers a well-rounded educational experience. It effectively prepares students for a variety of career opportunities, including those in academia, government service, the media, legal services, public policy, and nonprofit management. Of the 120 total credits students need to graduate with a bachelor’s degree, 33 must be anthropology focused. These classes cover core subjects like ethnography, social theory, and social problems, along with electives on cultural anthropology, archeology, paleontology, sociology, global societies, and biology. Among the many services available to students are academic advising, financial aid, career services, the library, and counseling. Distance learners can view lectures, course materials, and discussions when it is convenient for them, and they have similar access to instructors and peers as their on-campus counterparts. Eligible freshmen applicants to Regis and the anthropology online degree program must have a high school diploma or GED, submit a personal essay, and provide a current resume. Transfer students need to provide transcripts from all previously attended postsecondary institutions. They may transfer up to 90 credits toward their degree from Regis. Both Colorado residents and non-residents pay the same tuition. With a main campus in northwest Denver, Regis University is regionally accredited from the Higher Learning Commission. Southern New Hampshire University ranks among The 10 Best Online Bachelor’s in Anthropology Degree Programs! Through Southern New Hampshire University, students have access to one of the most vigorous four-year online anthropology degrees in the country. It blends science and the humanities while providing learners with knowledge and insights on cultures, societies, biology, linguistics, and archeology. The program also offers concentrations in geospatial technologies and environmental sustainability for those who wish to engage in more focused elective coursework. Students in SNHU’s online anthropology degree program take courses on world geography, earth systems, human evolution, cultural anthropology, and global religions. They can then supplement these experiences with elective courses in geography, political science, sociology, and information technology. Because SNHU is a completely online school, it delivers a variety of services to distance learners not often found at other colleges and universities. For example, the school offers dedicated counselors and coaches to help individuals work their way toward their degree, and students can make use of an alumni network of more than 75,000 professionals. While enrolled, distance learners can access a full digital library, academic advisors, online tutors, and 24/7 tech support. SNHU has a flexible admissions process and accepts most applicants who have a high school diploma or GED. It also accepts transfer students who have at least 12 credits of postsecondary coursework behind them, and its friendly transfer policy means it will take up to 90 credits completed at a different accredited postsecondary institution. All students, regardless of where they live, pay the same per-credit rate of tuition. SNHU is regionally accredited from the New England Association of Schools and Colleges. University of Houston - Clear Lake ranks among The 10 Best Online Bachelor’s in Anthropology Degree Programs! The University of Houston-Clear Lake gives students the opportunity to complete a BS in anthropology degree online in as little as two years. Because of its flexible and efficient class schedule, distance learners can take up to 10 courses per year when attending in the fall, spring, and summer terms. This arrangement has made the program one of the most convenient online anthropology degrees in the United States. Throughout the program, students learn from experienced and respected instructors who focus on building individuals' communication, critical thinking, analytical, and research skills. An appreciation for diversity and respect for different cultures is woven into the coursework. To graduate with a bachelor’s degree, students must complete 120 credit hours. Thirty-three of those hours must be in one’s major; subjects include cultural anthropology, social structures, social psychology, cultural diversity, and human rights and social justice. Many students complete their general education requirements at different schools and then take advantage of the university’s friendly transfer policy. Eligible incoming freshmen applicants must have a high school diploma and submit their ACT or SAT scores. Transfer students must be in good academic standing and provide transcripts for all colleges and universities they have previously attended. They also must have maintained a minimum GPA of 2.25 if transferring fewer than 45 credits or at least 2.00 if transferring 45 or more credits. The University of Houston-Clear Lake is regionally accredited from the Southern Association of Colleges and Schools. When enrolled in an anthropology degree online, you’ll learn how to compare cultural, biological, archaeological, and linguistic similarities and differences. Courses in an online anthropology degree help learners develop strong written, oral, and critical thinking skills, all of which are vital for success in many careers. Students learn how to gather and analyze qualitative and quantitative data, and use the scientific method. This research experience can aid graduates when seeking employment as field or laboratory technicians, or as research assistants, according to the BLS. An anthropology online degree provides a strong foundation in archaeology, ethics, and conservation. Common courses for this liberal arts major include world geography, earth science, arts and culture, and human origins and variations. Learners pursuing online anthropology degrees also complete core courses in English, such as first-year composition and college mathematics. Students can tailor a degree to their interests by choosing a concentration in areas such as archaeology, bioculture, geography, and linguistics. To broaden career opportunities, some programs allow degree candidates to combine an anthropology major with a minor outside the field, such as business or environmental science. Some online anthropology degrees require a capstone seminar, a final course that assesses a student’s knowledge and skills. What Will I Learn in an Online Bachelor’s in Anthropology Program? An anthropology online degree will give you the opportunity to learn about how and why humans evolved, and how biological, cultural, and social factors affect humans today. Course topics may focus on culture, evolution, social studies, and natural resources, but they will vary depending on the school you choose. Below, we’ve listed three common courses for an online anthropology degree. Introduction to Anthropology: This course provides an overview of anthropology’s four main fields: cultural anthropology, physical anthropology, linguistics, and archaeological anthropology. It also presents learners with an introduction to the study of culture, in which students compare and contrast different belief systems and social relationships in order to understand a contemporary world view. World Geography: By exploring how geography shapes human societies, degree candidates examine the significance of global location and earth’s topography. This course also provides a focus on the geosocial, geopolitical, and geo-environmental phenomena affecting today’s world. Finally, it prepares learners for a wide range of job positions, where graduates work with environmental and natural resources. Religions of the World: With a special focus on the world’s five major religions — Hinduism, Buddhism, Judaism, Christianity, and Islam — this course compares and contrasts various belief systems. Degree candidates examine the role of religious beliefs in the scope of human history. An online anthropology degree prepares students for many different occupations, including historic preservationist, human rights advocate, and cultural resources manager. The multidisciplinary program provides graduates with critical thinking skills and cultural sensitivity, traits which benefit those seeking employment in private business, government, nonprofits, and international agencies. Featured below are three common occupations for graduates with an anthropology online degree. Anthropologist: By studying the behavior, origin, and development of humans, anthropologists can help describe and explain cultures, languages, physical characteristics of people, and archaeological remains. Working with businesses, anthropologists may also perform market research. While most anthropologists must hold a master’s degree or doctorate, graduates with a bachelor’s degree may secure employment as research assistants or fieldworkers. Museum Technician: Commonly known as collections specialists or registrars, museum technicians protect objects in museum collections and exhibitions. Registrars oversee a museum object’s storage, transportation, insurance policies, and records. While museum technicians typically need a bachelor’s degree, some employers may require job applicants to hold a master’s degree in museum studies. Curator: Also known as museum directors, curators lead a museum collection’s purchase, sale, exhibition, and storage. They may also research a museum item’s authentication. Additionally, curators manage educational projects and perform administrative tasks. While curator positions usually require job applicants to hold a master’s degree, smaller museums may hire applicants with only a bachelor’s degree. When deciding upon an online anthropology degree, you’ll want to research the school’s accreditation, which ensures the school meets acceptable standards for students. The U.S. Department of Education provides oversight for the accreditation system in the United States by reviewing federally approved agencies. A university may hold either a regional or national accreditation. If a regional agency approves a school after an evaluation, the university will receive regional accreditation. The assigned regional agency depends on the school’s geographical location since only six agencies cover different sections of the country. Agencies recognized by the Council for Higher Education Accreditation (CHEA) award national accreditation. Educational institutions that focus on a specific vocation, technical education, or distance learning usually receive national accreditation. While both types of accreditation make a student eligible for financial aid, accreditation can affect transferring credit and employment after graduation. Most educational institutions accept transfer credits from regionally accredited schools more than from nationally accredited institutions, making this type of accreditation the more popular option. Professional anthropology organizations offer current students and recent graduates a number of valuable benefits, including the opportunity to meet and learn from others already working the field. As a member, you can receive career planning services, such as access to job boards and funding opportunities through awards. You can also learn about the latest research in the field by reading academic journals. With four different subfields of anthropology that cover culture, biology, archaeology, and linguistics, students and graduates can find specific information for their field. American Anthropological Association: With more than 10,000 members, the AAA serves as the world’s largest association for professional anthropologists. Founded in 1902, this association invites members to an annual conference, awards prizes and fellowships, offers career services, and publishes 22 academic journals. Society for Applied Anthropology: Founded in 1941, the SfAA promotes the investigation and application of human behavior to address contemporary issues. The SfAA serves 2,000 members and sponsors two journals, Human Organization and Practicing Anthropology. This association also awards a number of prizes to students and professionals. American Association of Physical Anthropologists: Formed in 1930, the AAPA serves more than 1,700 members throughout the world. The AAPA provides job listings, publishes the American Journal of Physical Anthropology, and welcomes more than a 1,000 students and scientists at each annual meeting.